Return to Freedom will try to reunite the stallions with their mares and restore, if possible, some of the family bands that were destroyed in the BLM helicopter stampede. 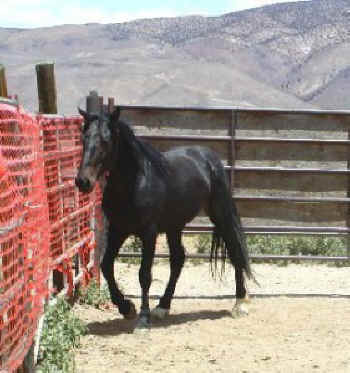 Eight wild stallions captured this year in a Bureau of Land Management roundup in Nevada’s Calico Mountains have been rescued by Return to Freedom’s American Wild Horse Sanctuary near Lompoc, CA. 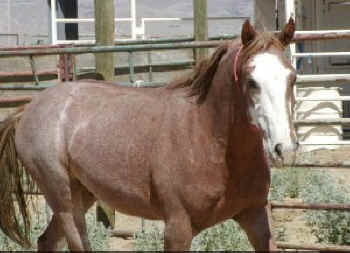 Return to Freedom placed the winning bids for the horses in an online BLM auction this week, said Neda DeMayo, founder and CEO. “These elder stallions represent leadership and wisdom for the Calico herds,” said DeMayo. 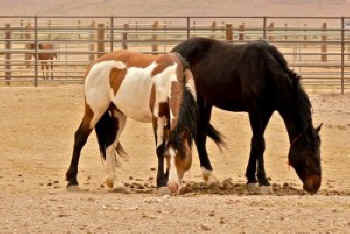 Return to Freedom will try to reunite the stallions with their mares and restore, if possible, some of the family bands that were destroyed in the BLM helicopter stampede, she said. 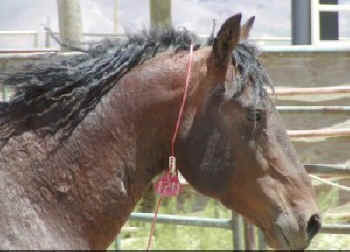 “This rescue is a gesture of restitution for what has been taken from these horses and an affirmation of our commitment to fundamental change in the BLM wild horse program,” DeMayo said. 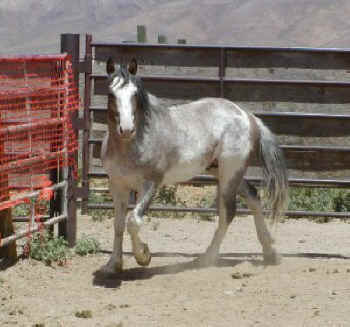 Between Dec. 28, 2009, and Feb. 4, BLM captured 1,922 horses from five Herd Management Areas (HMAs) in the Calico Mountains Complex in northwestern Nevada. More than 140 horses died as a result of the roundup and an additional 40 heavily pregnant mares spontaneously aborted, according to DeMayo. 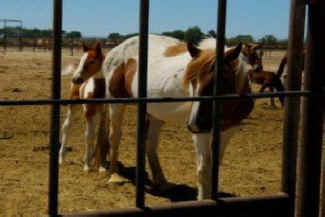 In April, Return to Freedom partnered with Soldier Meadows Ranch, which owns lands and grazing allotments adjacent to the Calico Complex, to offer a proposal to return many of the captured horses to the range. The proposal would provide a cost-effective model for on-the-range management of wild horses in order to avoid mass roundups and removals every few years, DeMayo said. Although BLM did not respond promptly to the offer, the agency has recently indicated a willingness to meet, she said in press release issued Friday. 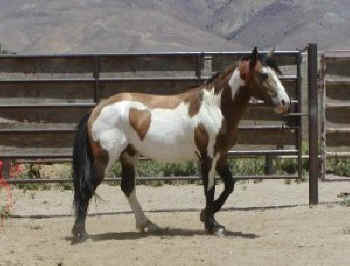 General, 22-year old band stallion. Captured on January 16, 2010 from the Warm Springs HMA. Commander, 25-year old stallion. Loyal companion to General. Captured on January 16, 2010 from Warm Springs HMA. True, 2-year old son of General. Captured January 16, 2010 from Warm Springs HMA. Tomahawk, 12-year old stallion. Captured on January 16, 2010 from Warm Springs HMA. Redman, 17 year old stallion. Best friend of Tomahawk. Captured on January 16, 2010 from Warm Springs HMA. 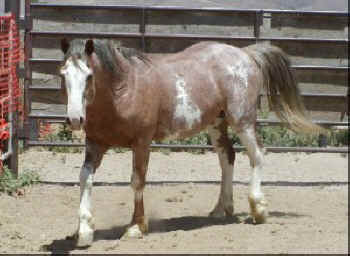 Unnamed 4-year old pinto stallion. Captured January 29, 2010 from the Calico HMA. 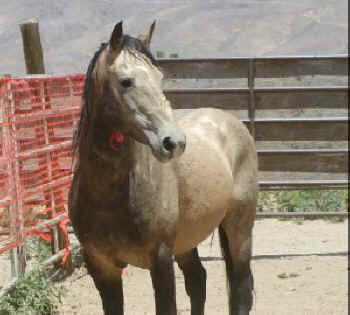 Unnamed 13-year old stallion. Captured January 20, 2010 from the Calico HMA. 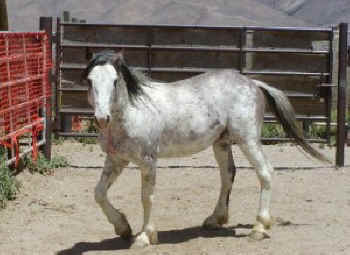 Unnamed 17-year old stallion. Captured January 2, 2010 from Black Rock East HMA. Return to Freedom has agreed to adopt this mare and her filly, captured from the Granite Range in the Calico Complex in January. RTF is delighted to offer this gorgeous pair sanctuary along with the stallions! 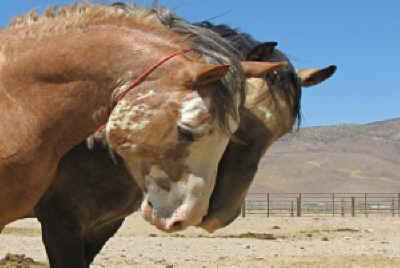 To support this rescue and the historic quest to reunite these majestic stallions with their mares and re-establish their family bands, please donate to Return to Freedom and specify “Calico Rescue Fund”.